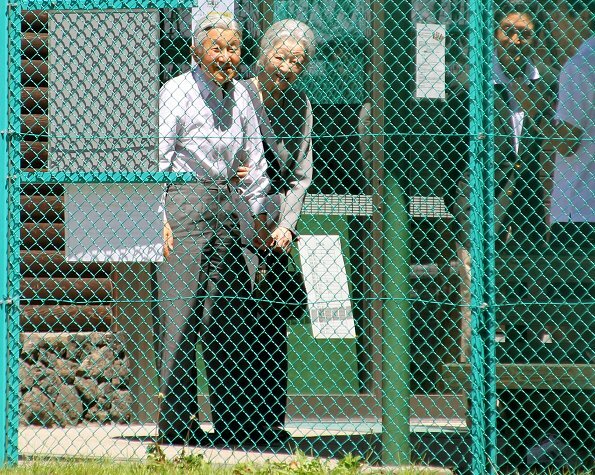 On August 21, 2016, Japanese Emperor Akihito and his wife Empress Michiko visited a tennis court in the mountain resort town of Karuizawa in Nagano Prefecture, Japan. They met for the first time at the court in August 1957. They are staying at a retreat in the town. What a cute couple! So sweet! Didn't they meet at a tennis match? Read in a biography that they played opposite each other and Michiko beat him. Supposedly, he fell in love with her that day and would not consider anyone else. That story reminds me of Spanish Juan Carlos and Sofia, Sofia did beat JC with judo.